, the fountain pen war of 1897, and an already distant family is torn even further apart. The front page of a 2-sided ad in Am. Stat., Nov 4, 1897, p.728a, pasted in between pages 728 and 729. Part 1, Early A. A. Waterman History. Some of this may be common knowledge to pen historians and collectors, but some of it is new to me. It was already known that A. A. Waterman’s first name was Arthur, and Michael Fultz had found out that the second “A” in his name stood for Allan, so his full name was Arthur Allan Waterman. But did you know that early on he published a magazine? He established A. A. Waterman & Co. as a bookselling and publishing firm at 36 Bromfield St., Boston, Mass., and published the magazine Waterman’s Journal between July 1889 and 1890 before he sold the magazine to someone else. I saw a few issues sell on Ebay over ten years ago, but since then quite a few references have shown up on Google, and Google Books. Here’s a short reference in History of American Magazines: 1885-1905 in Google Books. And if you do a Google search for “A A” and “Waterman’s Journal” you find a few more early references to the magazine. But here’s the best bit. Did you know that he was a traveling sales representative for the L. E. Waterman Co. for about ten years, from around 1886 to 1897? There’s a short summary of an interview with A. A. Waterman in The American Stationer from May 31, 1894, p.1021. At that time, he was still singing the praises of Waterman’s “Ideal” Fountain Pen. Another short item about A. A. Waterman from the Am. Stat., Oct 4, 1894, p.610, shows he is still a sales rep for the L. E. Waterman Co. Between 1894 and 1897, A. A. Waterman continued with the L. E. Waterman Co. as a traveler working out of his Boston office. His new additional territory was out in the West, and he also set up the various Waterman’s displays at expositions including the ones in Chicago, Atlanta, and New Orleans. In the article on Feb 6, 1896, p.244, we learn that at the latter exposition, A. A. Waterman was assisted by Steven J. Meyerpeter, who recently established the Waterman’s office in New Orleans. By 1896, A. A. Waterman was considered indispensable to the Waterman’s company. But in 1897, things changed drastically. A. A. Waterman left the L. E. Waterman Co. and turned his old company, A. A. Waterman & Co., into a pen company, A. A. Waterman Pen Co., at his same old address, 38 Bromfield St., and once also the old L. E. Waterman Co. regional office. So he must have left the L. E. Waterman Co. sometime in early 1897, and the L. E. Waterman Co. lost its star traveling salesman. Consequently, we learn on June 3, 1897, p.872, that Frank D. Waterman had to go to Boston to move the office to 19 Bromfield St. E. L. Gibson left Mabie, Todd & Bard to become a partner in A. A. Waterman Pen Co., and to run the New York office at 181 Broadway Ave. A. A. Waterman even persuaded the clerk at the L. E. Waterman Co., Nellie J. Fuller, to leave and switch over to his new company, but she was already the clerk and personal secretary in his Boston office, any way. Take a look at the articles on June 10, 1897, pp.912-14, and June 24, 1897, p.997. I always wondered why there was so much animosity between the L. E. Waterman Co. and the A. A. Waterman Pen Co. Well, this is why. L. E. and F. D. probably felt personally betrayed by this defection, and by this encroachment upon their territory and upon their name. Maybe they felt that he blindsided them, and caught them completely by surprise. It wasn’t just the similarity of the company names. It was more personal than that. They resented the fact that they had lost a salesman who was “favorably known to almost every dealer in the country”. The way they saw it, they helped to create him, not the other way round. After a series of co-partnerships, A. A. was seemingly forced out of his own company by his then partners Frazer & Geyer. And who was Steven J. Meyerpeter? He also eventually left the Waterman’s company and helped to run a series of other pen companies, including Resevo, and Modern Pen Co., the later incarnations of A. A. Waterman Pen Co. after A. A. was forced out of the company, so the story goes. Roger Wooten asked on Nov 13, 2012, “What happened with A. A. that he decided to make his own pen? The work situation at L. E. Waterman Co. must have been negative enough, probably matched with an opportunity with Gibson, to make him try his own hand at pen making. Not just that, though, as we see he sticks it to L. E. by calling it A. A. Waterman, since he could have called it Gibson, or anything else to avoid a confrontation. And A. A. doesn’t give up using Waterman, either, so it became a real point of principle with him. L. E. died in 1901, so it wasn’t just the old man that hated A. A., and I do think they hated him. Certainly L. E. was formidable, since other companies and people associated with A. A. actively hid from L. E. to make the Colonial pens”. Well, one reason he called it A. A. Waterman & Co. and not Gibson, or anything else was that he provided all the patents, and the expertise, and probably most of the funding. Although L. E. died in 1901, the new owners of both companies inherited all the animosities of their founders. But the second side of the ad, Am. Stat., Nov 4, 1897, p.728b, is the more interesting one. Part 2, The Waterman War of 1897, the company versus the man. And what’s the outcome of the A. A. Waterman story? Yeah, you guessed it. All that animosity between L. E. Waterman and A. A. Waterman caused another fountain pen war. But why did A. A. leave the L. E. company in the first place? Did he branch out on his own because he felt under-appreciated, and felt as if he stood no chance of advancement within the ranks of the nepotistic Waterman’s company? Did he have his own inventions and ideas that he wanted to put into production? Did they fail to appreciate him and give him credit for his suggestions for fountain pen improvements? He was the prodigious and prodigal stepson, and that’s what caused the fourth great fountain pen war. Let’s just review a little. In the May 31, 1894, p.1021, issue of Am. Stat., A. A. Waterman says he has been with the L. E. Waterman Co. seven years or more, and on Oct 4, 1894, p.610, A. A. Waterman is said to make Boston his headquarters when not on the road, and is said to be “thoroughly conversant with the fountain pen business, and is favorably known in all of the leading cities of this country and Canada”. On Jan 17, 1895, p.114, A. A. Waterman is quoted as saying that even though “some failed at first to appreciate its advantages, the new style ‘Ideal’ [fountain pen] holder is a success, and this holder is the leading make of the company”. On June 13, 1895, p.1044, it says that those handling the new style Waterman’s fountain pens “do not have to be advised; they know the pens and they know Mr. A. A. Waterman”. On Feb 13, 1896, p.288, F. D. Waterman seems to be describing A. A. Waterman when he says, “There is a peculiarity about the people in the West. They become not so much the customers of the [company] as of the traveler, and if he should [switch to another company], he would carry his trade with him. It is the man, not the goods, which they seem to look at”. On Apr 2, 1896, p.596, A. A. Waterman is said to be “so closely identified with the pen and the company he represents that it is difficult to determine to which is due the success of this pen. He is good at selling fountain pens”. On Sept 3, 1896, p.362, L. E. Waterman, Jr., is said to be visiting A. A. Waterman in the Boston office of the company, and “While L. E. is in town, he will join with A. A., and arm in arm see old trade friends together”. Unbelievable. Unbelivable! And this was still in late 1896. But then the next thing reported is on June 3, 1897, p.872. F. D. Waterman was in Boston with the new Boston office manager, Edward J. Kastner, attending to “the removal of the Boston branch to new offices at 19 Bromfield Street, located heretofore at 38 Bromfield Street”. L. E. Waterman Co. had just lost its best salesman and its old business address in Boston. On June 10, 1897, p.912-14, it reports that on June 1, Edward L. Gibson, “for some eleven years southern traveler for Mabie, Todd & Bard”, became a partner with A. A. and was in charge of the New York office, so A. A. stole a MT&B salesman as well. It also says that it had long been in A. A.’s mind to “utilize his extensive knowledge of fountain-pen devices and his experiences in the trade”, p.912, and that, “He understands the fountain-pen business and is favorably known to almost every dealer in the country”, p.914. On June 24, 1897, p.997, A. A. Waterman is called “for many years the chief salesman of the L. E. Waterman Company”, no less. The first A. A. Waterman Pen Co. ad in Am. Stat. appeared on July 15, 1897, p.87, but that page is missing from the online copy of that volume in Google Books. It gets worse later on, but don’t worry. It’s probably the same ad as the one on July 22, 1897, p.127. 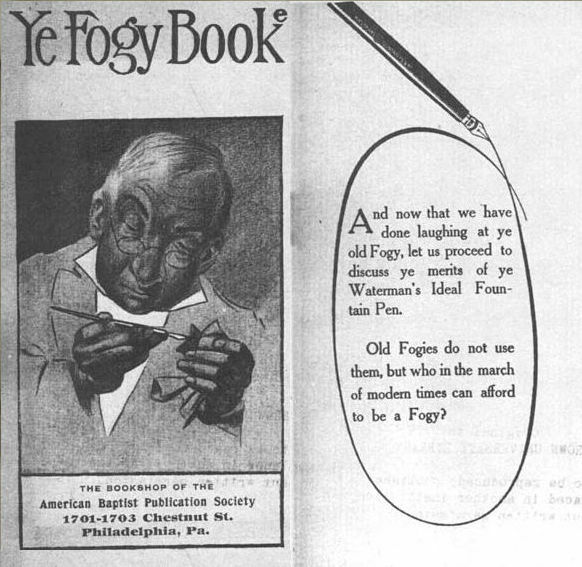 It doesn’t have an image of a pen in it, but the ads after the ad on Aug 5, 1897, p.207, all feature images of an A. A. Waterman “Standard” pen bordered by a fringe of sun rays, or flames, a motif used in much of the company’s early advertising. And then what happened? Oh yeah, the fourth fountain pen war started. An article titled “Waterman Versus Waterman” on Sept 2, 1897, p.361-362, says that the L. E. Waterman Co. “has again shown its determination to protect its patent rights by beginning another suit”. It goes on to say, “This latest fountain pen suit is likely to be as interesting, at least, as any which has hitherto attracted the attention of the trade”, and that the A. A. Waterman Pen Co. had “expected that the L. E. Waterman Company would, to use a slang expression, ‘jump on it’”. Again in the Sept 2, 1897 issue, on p.406, the “A. A. Waterman—that is the Boston Waterman—of the A. A. Waterman Pen Company”, is reported, in retronymic fashion, as preparing for a trip to New York to deal with the suit for infringement, but he also says, “We are filling orders as fast as possible, and the orders are coming to hand as fast as we can handle them”. Then the reporting of the formal suit begins. In an article on Sept 16, 1897, p.457-459, the title “A Breezy Complaint Filed This Week” was a polite, but disapproving way of saying that it was a “long-winded” complaint. It’s a report of the opening arguments in the L. E. Waterman Co.’s formal bill of complaint, and Am. Stat. seems to be taking sides with A. A. One of the complaints, among many, is that the defendant’s nibs “are made in the closest possible imitation of [the plaintiff’s], the shape and the form being almost identical”, p.457. L. E. Waterman Co. seems to be grasping at straws when it says that its gold pens “are distinguished particularly by having a circular opening at the head of the slit”. For goodness sake, L. E. even complained about A. A.’s nibs, and the style of the nib imprints! It gets even more petty. “The complainant asserts that the defendant rented from under it its former place of business in Boston, i.e., 38 Bromfield Street, and defendant not only did this, but it also hired away from it the clerk [Nellie J. Fuller] whom it had employed there”, p.459. And then L. E. asked the court for $10,000 in damages! The Am. Stat. article ends by reporting that L. E. has also brought three other suits for infringement, another one against A. A., one against Frazer and Geyer who made the “Lincoln” fountain pen, and against a stationer who was selling the Parker fountain pen. On Sept 30, 1897, p.537, a short report is given of the defendant’s rebuttal of the charges. “Several affidavits from members of the trade throughout the country” were offered as evidence. These included affidavits from 15 stationers, including Scribner’s and American News Co., and penmakers such as David W. Beaumel, Dennis Parrington, James C. Aikin of Aikin-Lambert & Co., William H. Sembler of W. S. Hicks’s Sons, and Rhodes Lockwood of Davidson Rubber Co. In the same issue, on Sept 30, 1897, p.554, the A. A. Waterman Pen Co. trademark is illustrated, and the heraldic devices utilized in the trademark are described and explained. One of the infringement charges was that this trademark resembled an L. E. Waterman Co. show card, but there is no resemblance at all. On Oct 7, 1897, p.561-562, a longer, more-considered report is given of the defendant’s affidavits and the plaintiff’s brief. First of all, the snide title of the article is “That Fountain Pen Suit”, but the article is full of great details from the court case. Among other things, L. E. Waterman claimed to have used the names “Reliable”, “Old Reliable”, and “Standard”, and sought an injunction to restrain A. A. Waterman from using those names for his pens. A. A. Waterman starts his affidavit with a short history of his involvement in the fountain pen trade. He was a traveling salesman for L. E. Waterman Co. at different times between 1886 and 1892, and was continuously in its employ from May 1892 to February 1897, when he left the L. E. Waterman Co. and established his own company, A. A. Waterman Pen Co. About May 1897, he began making his own pens, and on June 1, he became a co-partner with Edward L. Gibson. He said that he had been “since 1886 familiar with the business of the L. E. Waterman Company, together with the fountain pen trade”, and that in all that time L. E. Waterman Co. had never made, sold, or advertized pens named “Reliable”, “Old Reliable”, or “Standard”. They always used the names “Ideal” and “Waterman’s Ideal”. L. E. Waterman was just making stuff up. The article on Sept 16, 1897, p.457, states that the L. E. Waterman Co.’s complaint clearly says that it used the word “Standard” only since February 1897, after A. A. Waterman had left the company, and it used the word only in the form of a pictorial, color show card, a part of the design of which is a globe on which is printed the slogan, “Waterman’s Ideal Fountain Pen, Standard of the World”. It’s not a true model name, and it doesn’t resemble the A. A. Waterman trademark at all. In fact, it could be charged that once L. E. Waterman Co. was aware of the use of the word by A. A. Waterman Pen Co., they started using the word to try to steal it away from them, and tried to establish priority and to pre-empt the use of it by A. A. Waterman, and so that they could later try to use it in a lawsuit against A. A. Waterman. To the complaint that he was imitating the plaintiff’s nibs, he stated that they are similar in shape and design, but “both are in common use, [the aperture] having been adopted from the original dip pen of commerce, which has been in use many years”, and “that their pen apertures are wholly dissimilar”. On A. A.’s pens, they are circular on the $1.25 pen, but cone-shaped on his more expensive pens, while L. E.’s pen apertures are either heart-shaped, or horse-shoe-shaped at the slit with a circular aperture above the slit. He also goes into the design of the caps, and the placement of the holes. “The vent holes in the plaintiff’s caps are in the side, while those of the defendant are in the end of the caps.” By the way, and as an aside, you’ll notice that the hole in the nib is said to be “adopted from the dip pen”, and is called a “circular opening at the head of the slit”, and a “pen aperture”, but never a “vent hole”, or a “breathing hole”. Only the holes in the cap actually do any breathing and are worthy of being called “vent holes”. If the apertures in fountain pen nibs had been adopted from the common steel nib, then the aperture is not a breathing hole because the dip nib does not need to breathe. But again, I digress. As for the charge of taking over the L. E. Waterman Co. address for fraudulent purposes, and to confuse people into thinking the defendant’s company is that of the plaintiff, he states that he leased the office at 38 Bromfield St. only “after the expiration of plaintiff’s lease”, p.562. In fact, A. A. had already been using that address previously for his other business ventures, such as the publication of his magazine, and as his home base during his traveling salesmanship. 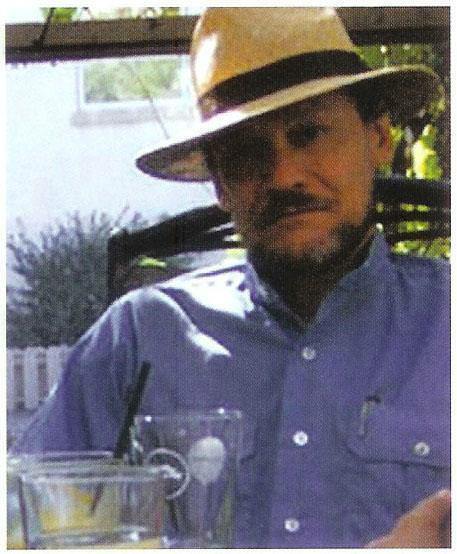 The landlord states in his affidavit that he terminated L. E. Waterman’s lease and offered the space to A. A. Waterman “because he had known him for many years, and was personally agreeable to him, and because he preferred him to a stranger”, p.562. L. E. Waterman claimed that A. A. Waterman even persuaded Nellie J. Fuller, the clerk at the L. E. Waterman Co. office in Boston, to leave and switch over to his new company, again for the purpose of deceiving the public. Well, the full truth is that she left “because her wages had been reduced one-third, so she terminated her employment with the plaintiff and offered her services to the defendant and was employed by it on account of her skill and experience in the fountain-pen business”, p.562. Also, A. A. Waterman was her brother-in-law. In spite of all this, the plaintiff claimed that it was “entitled to a most sweeping injunction, restraining each and all of these fraudulent acts”, basically that the “defendant corporation has adopted a name containing the name of a predecessor or rival in business”. The next issue of Am. Stat., Oct 14, 1897, p.601-602, continues the dissection of the lawsuit by taking up 5 points in A. A. Waterman’s case so that its readers “should therefore be able to form an unprejudiced and individual, though not judicial, opinion as to the merits of the present controversy”. It’s a real shame, but this volume of Am. Stat. is really ragged, and the final page of the article, p.602, is missing in Google Books, and only the first three of these points are enumerated and fleshed out. There is a detailed comparison of the ads of the two companies by the counsel for the defendant, and at one point in the brief he sums up by saying, “The allegation that some of the defendant’s advertisements are very close imitations of the plaintiff’s show card is simply ridiculous”. In general, he states, “Moreover, certain of the allegations of the complaint are calculated to mislead the court”. In dealing with the nibs, he says, “As a matter of law it will be seen later the plaintiff can acquire no exclusive right to use particular shapes of pens and holders, and as a matter of fact the gold pens used by both the plaintiff and the defendant are almost identical in shape with the ordinary dip pens of commerce, which have been in use for years, the only difference being that the pens are made smaller so as to fit the holders, and the holders used by both plaintiff and defendant are the ‘standards’ in common use”. The counsel for the defendant refers to the plaintiff’s ads, circulars, catalogues, letter heads, business cards, and signs as “materials furnished by the plaintiff itself to refute its own contentions”. And as for any similarity of their trademarks, “the trademark of the plaintiff is ‘Waterman’s Ideal Fountain Pen’ and nothing more”. But that’s all, because p.602 is missing. The case was settled in 1898, but the next volume of Am. Stat. is missing as well, so we don’t get to read about the outcome. But still, some other interesting things show up before the 1897 volume peters out. On Oct 21, 1897, p.674, [not only is this whole volume scrambled, but for some reason this page appears in Google Books only, and not in Hathi Trust, so I can't link to it] we learn that L. E. Waterman Co. is also suing W. S. Hicks’ Sons because they manufactured the gold pens for the A. A. Waterman Pen Co. The plaintiff’s counsel is quoted as saying, yet again, “The circular opening in the A. A. Waterman pen, made by W. S. Hicks’ Sons, is substantially the same form, and is a pretty close imitation of the circular opening in the L. E. Waterman Company’s pen, and is used by no one else”. Really? L. E. Waterman Co. seemed to be claiming that all circles looked alike! And that they had the exclusive right to use a “circular opening”. Now, how silly is that?! Waterman was almost as silly as Wirt. For the same reason that you cannot claim a scientific principle like capillarity, you also cannot claim a basic geometric figure like a circle! On Nov 4, 1897, p.728, we learn that L. E. Waterman Co. is now suing the Boston stationer Thorp & Martin Co. for selling A. A. Waterman’s pens. “The suit is one of a series already brought by the plaintiff company against those who are concerned in the sale or manufacture of the A. A. Waterman Pen Company’s pens or its parts”. One of the complaints seemed to be that up until then they had the roost all to themselves, and that only “L. E. Waterman pens were generally known to the trade as Waterman Pens”, and that now they had to be differentiated from the other Waterman pens, retronymically. A further complaint is that the defendant has had a man in their store window writing with their pens, and “that said man in said window would write verses to [rhyme] with the name ‘Waterman’; that furthermore, this man would also write the words ‘Over a million in use’; that this statement was false and misleading; that there are not over a million pens made by the said A. A. Waterman Pen Co.”. L. E. Waterman Co. also commenced a suit against Davidson Rubber Co., makers of the holders for the A. A. Waterman pens. There’s a vindictiveness in all of this, and it’s almost as if L. E. were using A. A.’s list of affidavits as a hit list for these nuisance lawsuits. Next is an ad for “A. A. Waterman’s Standard Fountain Pen” from the same issue, Nov 4, 1897, p.728a. The 2-sided, color-insert page is pasted into the magazine, and for that reason it is unpaginated, but it fits in between pages 728 and 729. The first side repeats the A. A. Waterman Pen Co. trademark three times in red and black. But the second side, Nov 4, 1897, p.728b, is the more interesting one. First of all, it illustrates the “Standard” and “$1.25” pens, and the workings of the middle-joint eyedropper filler is shown in a cutaway illustration. And second, the ad copy extolls the benefits of the middle joint, which it calls the “double joint” because of the double set of threads. But third, and best of all, it reads in part, “Ideas as to the holder beveled at both ends to receive the cap, advocated by A. A. Waterman in 1891, were reluctantly adopted later by a manufacturer, one of whose skilled employees improved the first suggestion, but kept the old and faulty idea as to the ink joint [under the finger grasp]”. This is astounding! A. A. Waterman not only claims to have come up with the idea for the cone cap in 1891, and that the “old fogeys” at L. E. Waterman Co. “reluctantly” put the idea into practice only in 1894 with its new second style of holder, but also that they did so without giving him credit for the idea. Perhaps they rewarded him by giving him a full-time job as a traveling salesman in 1892. It’s okay, because in the next five years he learned the trade even better, and established a lot of good will with his future customers. He also claims, either that he offered his middle-joint idea to L. E. Waterman Co., and they refused it, or he is simply rubbing their own ink-blotted fingers in their faces with the fact that they were still using the “old and faulty idea of an ink joint at the fingers. As late as 1903, Waterman’s was still patenting ideas for ways to cover up “the old and faulty idea as to the [leaky] ink joint”, mentioned before in this post. 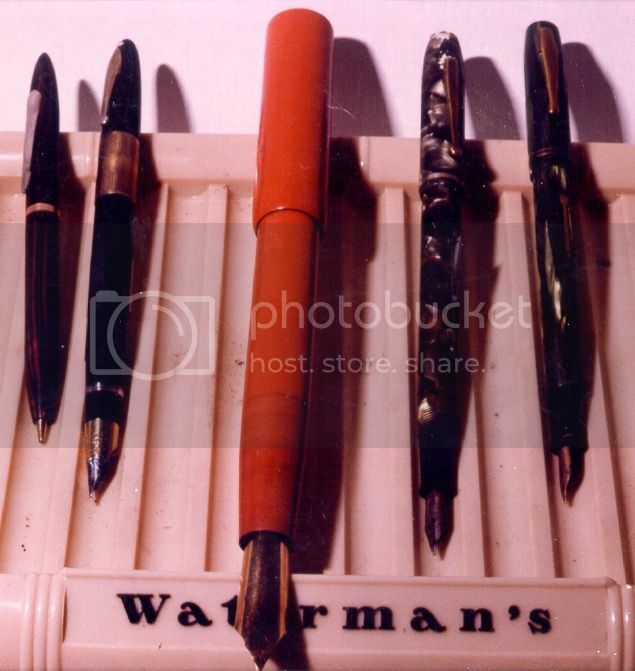 It’s also ironic that the man who came up with that Waterman’s patent to cover up the leaky ink joint is Edward J. Kastner, the man who L. E. Waterman appointed to cover the Boston office after A. A. Waterman left the company in the lurch in 1897, and then came up with the middle joint idea. An L. E. Waterman’s advertizing brochure, ca.1906, pp. 1 and 9. And now that we have done laughing at the old fogey, L. E. Waterman, let us proceed to discuss the merits of the A. 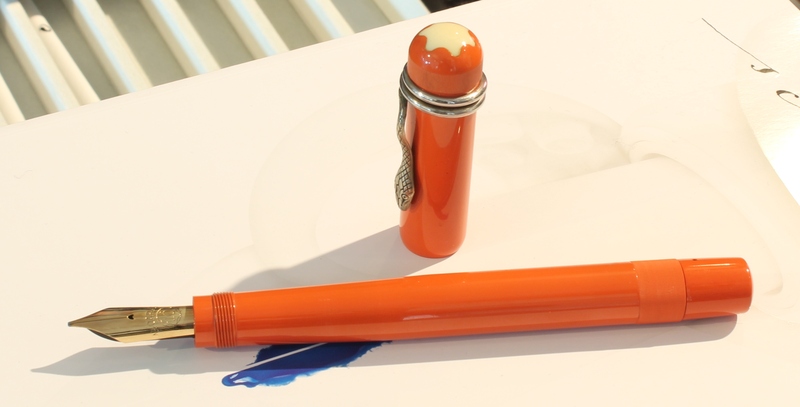 A. Waterman fountain pen. And lastly, on Nov 4, 1897, p.730, there is a short mention of A. A. Waterman. “He reports that business generally is good wherever he has traveled, and that in respect to the business of his own firm that it is several thousand pens behind in filling orders”. And then silence, because the next 16 volumes of Am. Stat. are missing. But until someone finds the missing pages and missing volumes, or until someone finds the court cases in LexisNexis, there is a tantalizing clue in the issue of Mar 19, 1910, p.8. This time the court case being reported is Chapman v. Waterman Co. Isaac E. Chapman and William I. Chapman were the acting owners of A. A. Waterman & Co., and they were seeking restraining orders to stop L. E. Waterman Co. from interfering with their retailers and bringing suits against them for selling their pens. The Chapmans lost, but here’s why. The judge’s decision reads in part, “The present plaintiffs [the Chapmans] were not parties to the decree in the action of Waterman vs. Waterman and therefore are not entitled to the benefits accruing thereunder”. So A. A. Waterman must have won some concession in the first case, after all. That is, he won the 1897-98 battle, but the successor company eventually lost the 1917 war. Here’s how it happened. A. A. Waterman formed a co-partnership with Edson E. Dewey in May 1899, but the co-partnership was dissolved in December 1900. All the assets of the company were assigned and transferred to the Colonial Pen Co. to satisfy a debt, and Waterman formed a new company in 1901, the Modern Pen Co., but he continued using the name A. A. Waterman Pen Co. He should have learned his lesson by now, but he entered one last, and fatal for him, co-partnership with Frazer & Geyer who also owned the Lincoln Fountain Pen Co. Waterman received 5 patents between 1897 and 1904, but was ostensibly forced out of his own company, Modern Pen Co., by the other directors, and Frazer & Geyer took over in 1904 or 1905, or so the story goes. The company passed through a series of owners and a series of court cases brought against them by the L. E. Waterman Co. Then on June 29, 1912, p.18, we read that the Waterman injunction was made more severe, and they now had to imprint their pens “Not connected with the L. E. Waterman Company”. But the real outcome of that case was that the L. E. Waterman Co. shot themselves in the foot, and the A. A. Waterman Co. finally got its wish and was allowed to put the name “L. E. Waterman” on its pens! Stephen J. Meyerpeter, another former L. E. Waterman Co. graduate, was a later part-owner of Arthur A. Waterman & Co., so he stole yet another valued employee from them. Then in 1917, the Chapmans went to court against L. E. Waterman one last time, but lost and were forced to stop using the name “Waterman” altogether. They had to change the company name back to Modern Pen Co., but they continued to use the letters “A. A.” In the end, that was all that was left of A. A. Waterman’s pen company name. All of this information about A. A. Waterman & Co. helps to remedy the gap situation somewhat. It looks like A. A. was a real thorn in L. E.’s side, trying to sell L. E.’s pens at cut-rate prices. It was something that A. A. himself expressly argued against in a previous Am. Stat. article, Jan 30, 1896, p.188, while he was still a traveling salesman for L. E. Was he himself now selling at less than list price in order to get back at L. E.? What all of this really highlights is the need to get access to the full transcripts of the court cases. One prime example of the use of original transcripts is the very thorough article written by Daniel Kirchheimer about the “Sheaffer v. Featherweight” court case. Reading the original court transcripts is the only way to completely remove all ambiguity. These reports in the Circular are very sketchy, and nowhere do we ever read the actual outcome of the case. We are told that some minimal costs were paid, but we are not told the decision on the so-called Waterman’s trademarks, and the use of “Waterman” by A. A. in his company name. All this legalese, this court-case talk of appeals, and demurrers, and overruling this, and affirming that, is very confusing, and then on top of it all, no decision. The best thing of all is the Gibson obituary on Aug 23, 1899, p.31. It’s packed with new information about A. A. Waterman. But the most frustrating thing in all the digitization of magazines by Google Books, not just the Circular, or Am. Stat., is the incompleteness of the runs of the magazines. One really can’t come to any conclusions until the full runs of the magazines are placed online. All the work Google has done so far is tantalizing, and much-appreciated, but really frustrating. On Feb 12, 2014, David Nishimura posted on his blog about the Waterman genealogy book, The Waterman Family: Descendants of Robert Waterman of Marshfield, Mass., from the Seventh Generation to Date, by Donald L. Jacobus and Edgar F. Waterman. It is a book in 3 volumes published in 1939, 1942, and 1954, but the second volume is the most useful one for Waterman pen history. It is also available at the Internet Archive, and here is vol.2. David mentions the sections concerning L. E. Waterman on pp.46-47, and Frank D. Waterman on pp.48-52, but I posted these comments on his blog. “Did you also notice this? On pp. 83-84 Arthur A. Waterman is listed as the ‘first inventor and manufacturer of a middle joint fountain pen’, and that he later moved the company to Chicago ‘where he carried on the business until his retirement about 1919’. So as this more recent research has shown, he was only ostensibly forced out of his own pen company in 1905, but instead carried on until his retirement around 1919. His family also claimed ‘it was purely a coincidence that two Watermans were making fountain pens at the same time’. There is a deep genealogical tie between L. E. and A. A. They are both related to the original Robert in the title of the book, who died in 1652, and his son John, who died in 1718, but then their genealogical lines diverged. They were related as cousins about 5 or 6 times removed”. David wrote, “Interesting that the A. A. Waterman family lore left out the fact that A. A. worked for L. E. before striking out on his own”. What’s also interesting is that A. A. claims that he was an owner of his company all along till his “retirement about 1919”. This is one of those instances of A. A. “actively hiding” that Roger Wooten mentioned earlier. He only pretended to be forced out of his own company in order to hide from the L. E. Waterman Co. In effect, the company lost its name in four stages. First, the outcome of the court case in 1898 required them to place “Made by A. A. Waterman & Co.” on their pens. Second, in 1910, they had to change the company name to Arthur A. Waterman & Co., and they had to place “Not connected with the original Waterman” on their pens. Third, in 1912, they had to imprint their pens “Not connected with the L. E. Waterman Company”. And fourth, in 1917, they were forced to stop using the name “Waterman” altogether, and to change their company name to “Modern”, but they could continue to use “A. A.” as a trademark. And here’s the coda to this history of the A. A. Waterman Pen Co. In the Am. Stat.’s “Information Bureau” question No. 6369 on Mar 25, 1922, p.22, the “Bureau” was asked for the address of the A. A. Waterman Pen Co., but they gave the address of the L. E. Waterman Co. instead of giving the address of the Modern Pen Co., even though the Modern Pen Co. was still an active advertiser in Am. Stat. at the time, and was still in business at least as late as 1925. The company was either forgotten by the “Bureau”, or the “Bureau” was sucking up to one of the magazine’s major advertizers. It exposes the true nature of the “Information Bureau”, not as factual information, but as advertizing propaganda. If any of these links go dead, cut and paste the URL into the Wayback link. © The Writing Hand Press. Watermark theme. Powered by Blogger.